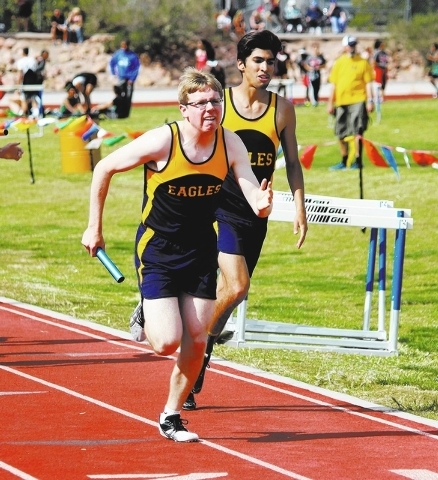 Although few Boulder City boys or girls finished in the top five places at their own Ron Resler Track and Field Invitational Friday, the Eagles coaches were happy with the efforts of the athletes. The Ron Resler event is known each year as one of the best early-season invitationals because of the depth of talent. This year it featured nearly 900 participants from 44 schools from several of the state’s divisions. “There was a lot of talent there and it was good experience for all our athletes,” boys track coach Josh Fisher said. “The Resler is a huge meet with so much talent from so many divisions in the state that it prepares our kids to go up against the best in the upcoming region and state meets. The boys placed 10th with 36.5 points behind champion Desert Oasis, which had 75 points. In the 300 meter hurdles, Brooks Roe ran an impressive race against a field considered to be as good as he will face in the Division I-A state championship in May. He placed second with a time of 41.43 seconds, while teammate Jacorey Dixon was fourth in 41.63. The 300 at the Division I-A state meet is expected to be a showdown between teammates Roe and Dixon. Andrew Sands was fifth in the shot put with a throw of 46-8. Garrett Meyer was fourth in the 1,600 meters with a time of 4:38.78. The girls placed 13th, 13 points behind champion Coronado, which edged Green Valley 99.5 points to 99 points. Whitney Barlow was fifth in the shot put with a toss of 32 feet, 9 inches. Jana Williams was third in the 300 meters with 49.43. The track teams are off for spring break and their next meet is at 4:30 p.m. Wednesday when they travel to Cheyenne for a triple-dual meet against Chaparral, Mojave and Cheyenne.